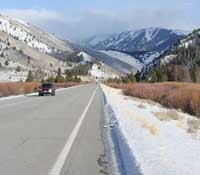 The Idaho Transportation Department won't be realigning a 1.5-mile stretch of state Highway 75 near Phantom Hill north of Ketchum to restore wetlands as earlier planned. The realignment was to occur in the Boulder Flats area south of Phantom Hill as mitigation for wetlands that would be lost by highway expansion farther south. Now, ITD, in conjunction with the U.S. Army Corps of Engineers and the Federal Highway Administration, has decided the plan isn't going to work. The decision was announced by Devin Rigby, district engineer for ITD District 4 in Shoshone, at a meeting of the Blaine County Regional Transportation Committee on March 1. Rigby explained that additional studies since the expansion project's final environmental impact statement and record of decision were approved in 2008 have shown that moving the highway will only damage other wetlands in the area. Wetlands mitigation, whether the wetlands be natural or man-made, is required for highway projects by the federal Clean Water Act. The quality of the wetlands to be disturbed determines the ratio of new wetlands that need to be created. Destroyed natural wetlands are required to be replaced at ratios as high as 3-1 or even 5-1. "The numbers are the story," ITD spokesman Nathan Jerke said Wednesday. If built, the highway expansion project, which would widen and improve a 27-mile stretch of state Highway 75 from Timmerman Junction to Saddle Road in north Ketchum, would destroy 2.53 acres of natural and man-made wetlands. Since about half the wetlands impacted are natural, ITD is required to create 6.3 acres of wetlands as mitigation. The proposed Boulder Flats mitigation plan would have created those 6.3 new acres. Construction of the existing roadway there had separated previously existing natural wetlands. However, ITD and the federal agencies involved have now determined that moving the road would destroy more than two additional acres of natural wetlands and would require mitigation elsewhere for that loss of another 6.12 acres of wetlands. "We would have been negating any progress we would have had," Jerke said. The highway realignment was planned to be done in 2015. It would have moved a 1.5-mile straight section of highway from its current path over to the east, closer to the Boulder Mountains. The section is part of the highway used each summer for cars to obtain speeds approaching 200 mph in the Sun Valley Road Rally, a fundraiser for the Blaine County Community Drug Coalition. Jerke said ITD will now have to look at other wetland mitigation options and will ultimately have to revise the highway expansion project's EIS and record of decision. Wetlands mitigation is only one of two projects in the highway expansion plan that are fully funded. The other is a 3.25-mile expansion project of Highway 75 from Timber Way just north of East Fork Road to the bridge over the Big Wood River near St. Luke's Wood River. That project remains on schedule for construction in 2013. Jerke said it is not anticipated now that a delay in wetlands mitigation will delay the Timber Way project. He explained that the Federal Highway Administration, which provides most of the funding for state highway projects, requires that "significant progress" be underway for wetlands mitigation before highway construction begins. However, the Timber Way project will destroy less than one-tenth of an acre. The remaining seven projects for highway expansion remain without funding, except for design of a new bridge over the Big Wood River near St. Luke's. ITD announced in 2011 that funding for the remaining projects remains uncertain for the foreseeable future.